FAT-the name may raise a few eyebrows. Why would anyone like to enter a place that sounds like they'll be few pounds heavier as soon as they leave? I'm pretty sure some people won't mind, but conscious and healthy eaters might think twice about stepping inside the restaurant. We finally visited FAT Restaurant in Forbes Town Center, BGC, ready to face the consequences of our decision. As they say, you either go big or go home, and we definitely went to FAT to stay. 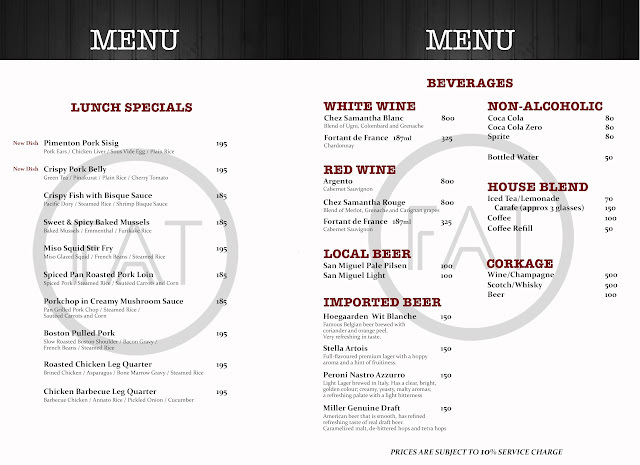 We learned that the menu at FAT changes once in a while, to give loyal patrons something new to look forward to every time they visit. 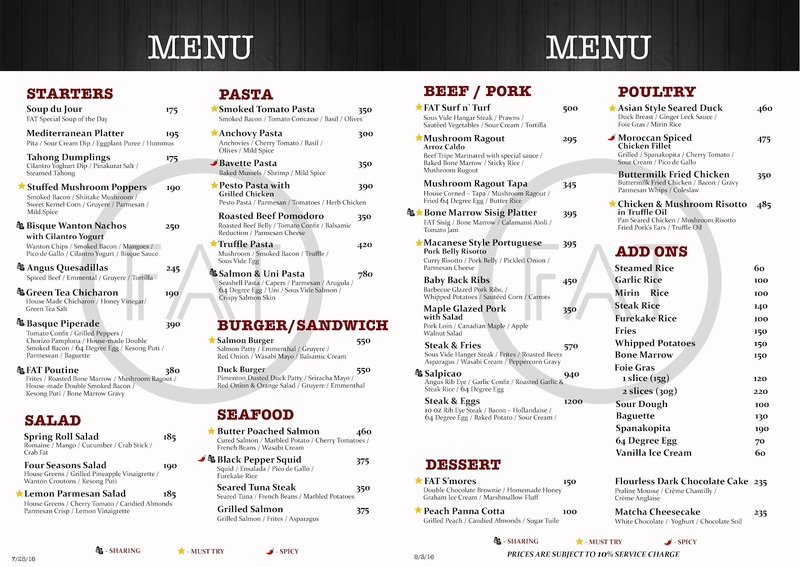 Of course, best-sellers such as the Green Tea Chicharon, FAT Poutine, Salmon and Uni Pasta, Duck Burger, and Moroccan Spiced Chicken are regulars on the menu. 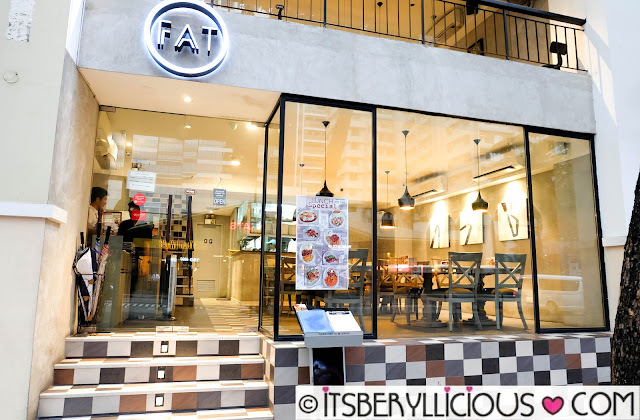 We were able to try the new dishes at FAT for this month of August. Starting off with an appetizer of Tahong Dumplings (P175)- six pieces deep fried dumplings filled with steamed mussels with pinakurat salt, served with a cilantro yohgurt dip. D liked this very much, especially the cilantro dip which he basically used in every dish we had. Next is the Smoked Tomato Pasta (P350) which is an oil-based pasta, mixed with smoked bacon, tomato concasse, basil, and olives. 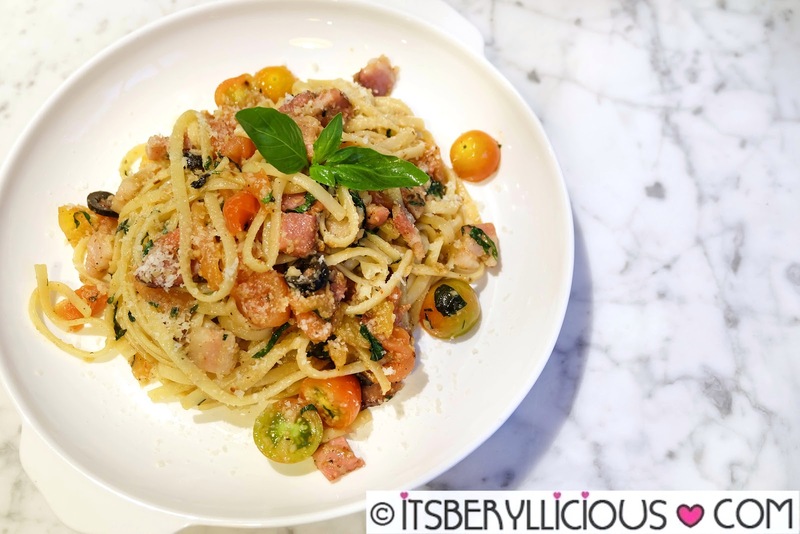 Though the pasta was oil based, it was still very tasty and packed with flavors. Serving was quite generous, an order can already be shared by two people. 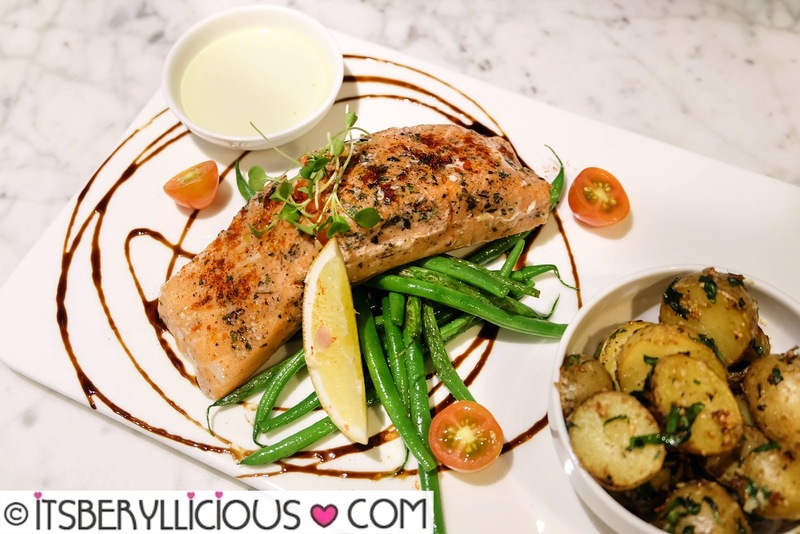 For mains, the Butter Poached Salmon (P460) was a unanimous favorite. The cured salmon was tender and moist, served with crunchy french beans and marbled garlic potatoes. The salmon was a tad salty on the top layer, but overall, it was a well executed dish. A must-try! 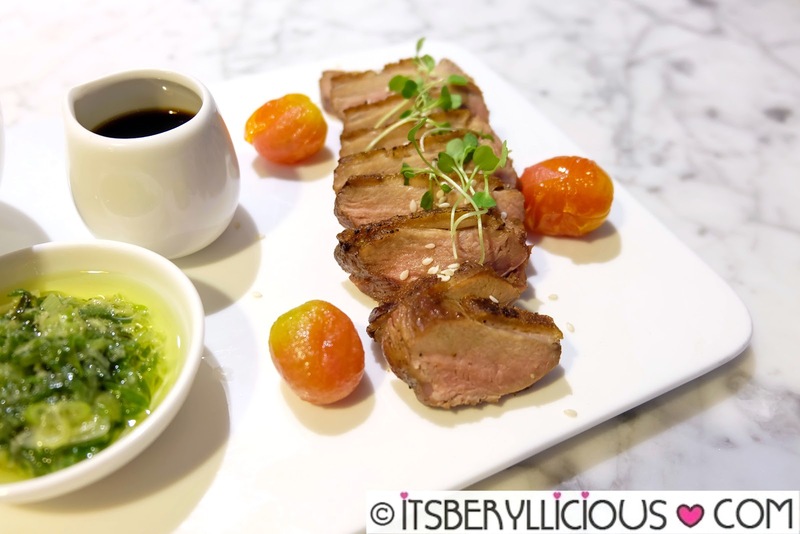 The Asian-Style Seared Duck (P460) highlights two of the best parts of a duck. 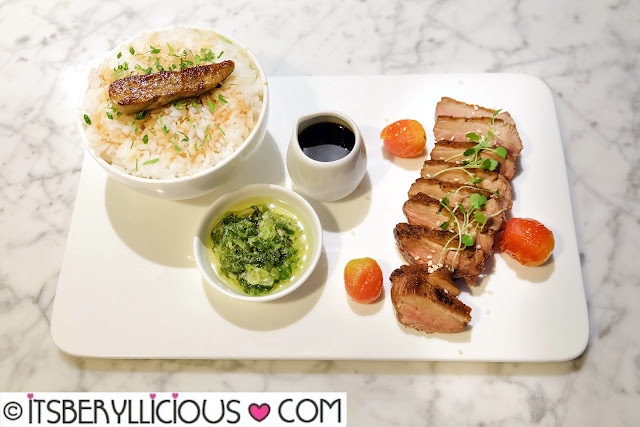 The duo of seared duck breast and liver, comes with a ginger leek sauce, and mirin rice to complete your meal. Another must-try dish at FAT this month is their new Mushroom Ragout Arroz Caldo (P295). 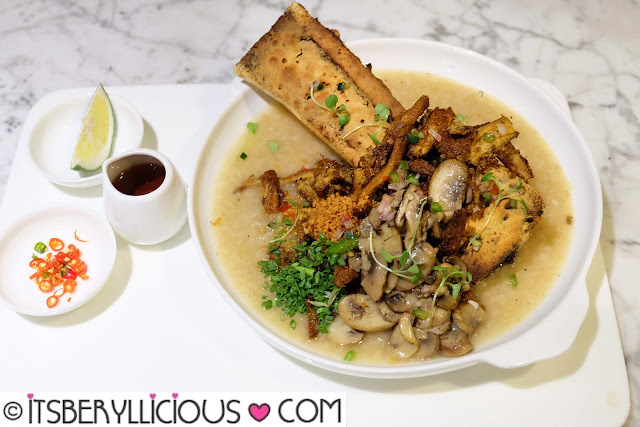 The Filipino-style congee is made with sticky rice with marinated beef tripe and mushroom ragout, featuring a huge slab of baked bone marrow. Sinfully good! 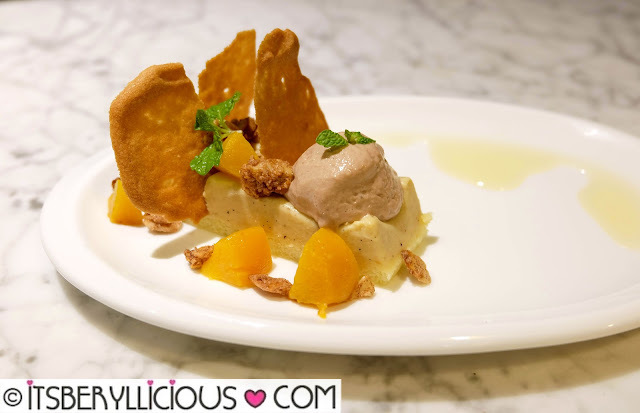 For dessert, we had this Peach Panna Cotta (P100) with chiffon base, sugar tuile, candied almonds, chocolate mouse and grilled peaches. 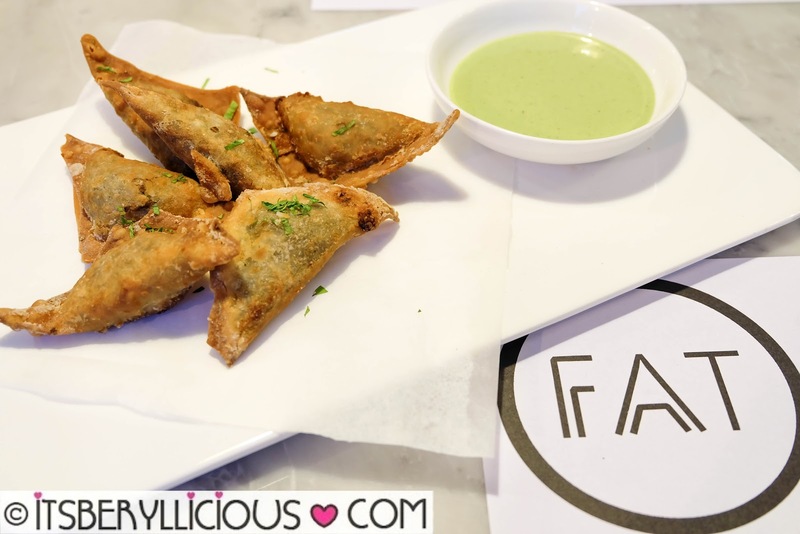 It was a delightful choice to end such a filling feast at FAT. 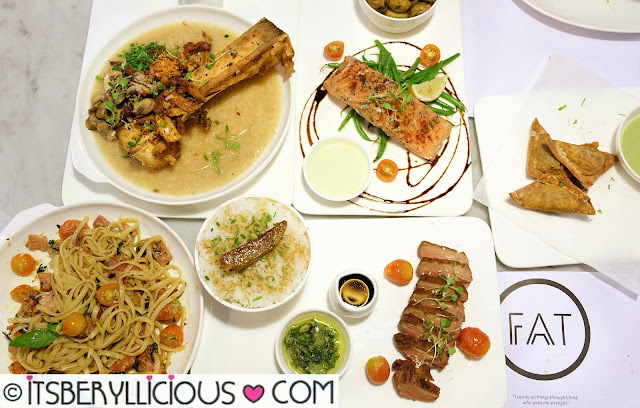 Our favorites at FAT are the Tahong Dumplings, Butter Poached Salmon and Mushroom Ragout Arroz Caldo. I personally did not find the dishes at FAT heavy nor over-the-top-sinful as other people might think. 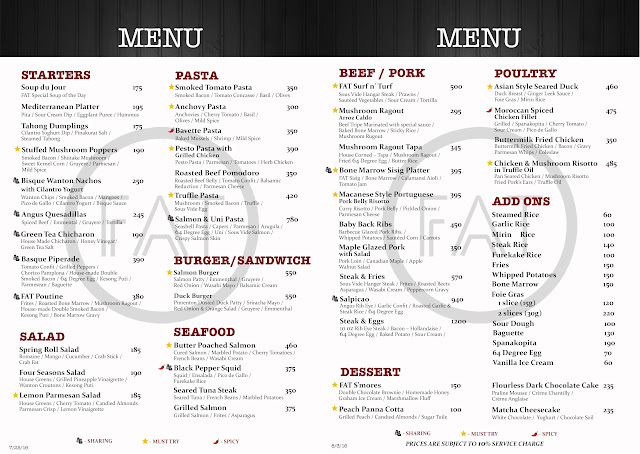 In fact, I was quite surprised that they have light food selections such as pasta, salads and seafood items. 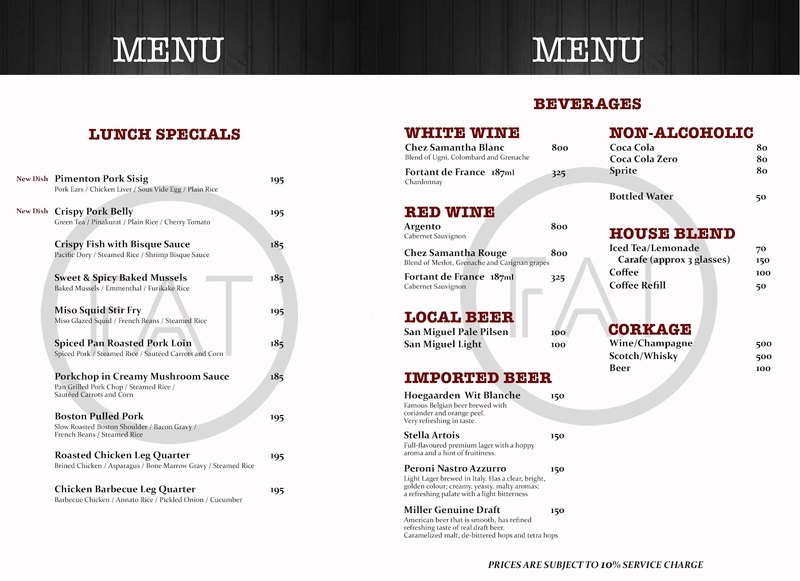 FAT is basically about creative dishes packed with bold flavors that will certainly give you the cheat meal you deserve.